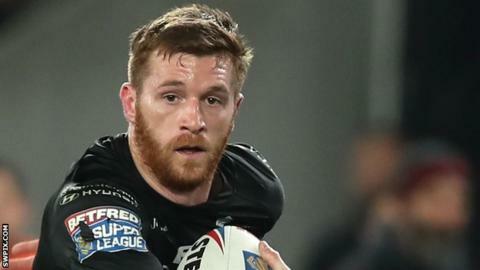 Scrum-half Marc Sneyd has signed new three-year contract with Hull FC, which will expire in the autumn of 2022. The 28-year-old joined the Airlie Birds in 2015 and has since won two Challenge Cups, taking the Lance Todd Trophy for man of the match in consecutive years. The Oldham-born playmaker has made 115 appearances, kicking 408 goals and landing 24 drop goals in Hull colours. "It's a massive weight off my shoulders," Sneyd said. "Now I can fully concentrate on playing my rugby." He added: "The rugby is going really well at the moment and my family is really settled here in Hull, so there was never any reason for us to move away. "I am really looking forward to just cracking on in the next few years and hopefully we get the chance to win a few more trophies." Analysis and opinion from the BBC's rugby league correspondent. Enjoy the best debate, analysis and interviews with BBC 5 live and World Service plus our rugby commentary listings. How to get into rugby league - a crowd-pleasing, physically demanding game with few stoppages and plenty of pace.